The SwissStop FlashPro Black Prince Brake Blocks provide unbeatable braking in both wet and dry conditions. Designed with a complete absence of abrasive materials to not damage your carbon rims, the blocks offer silent operation. Providing consistent braking from -20C to +40C, the pads will help to significantly reduce braking distance. - L.M. Fair enough these are pricey- but if you've shelled out for carbon rims it's already too late to turn around. The last thing you need is to go careening past your mates on your inaugural ride due to cheap-skating on blocks. I've used these throughout winter and they are surprisingly good. I haven't noticed any huge difference compared to my Ultegra blocks despite what all the various storm systems & snow flurries that the wrong end of Europe could throw at me. Not overly grippy, no locking of the wheel due to excellent modulation. Can't comment on wear rate, but at this early stage they do appear to wear on the fast side. A small price to pay for A+ performance elsewhere. These brakes are really good. I put them on my old bike and now it stops right when I want. These stop better than the Shimano specific pads on my C35 tubulars. They have minimal black build-up too. But as an old track star once said to me "stopping is not important-going is important". 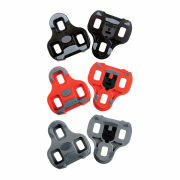 This block is excellent for a wide variety of carbon rim brands. 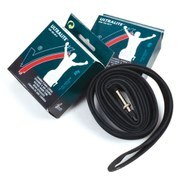 I have used it with Shimano, Zipp and Colnago branded carbon rims wit excellent results. It's quiet and stops well and controlled. Thea wear is about average. I have placed about 300 miles on these pads and I am very satisfied with their performance. I am using them with a set of unbranded carbon wheels and the braking distance and quietness of these pads is a noticeable improvement from the pads that came with the wheels. The only drawback I can see is that these pads seem to wear more quickly. 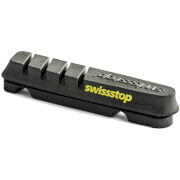 Great carbon brake pads no noise and really progessive braking! Fast wear, takes a little getting used to in terms of sticky sudden grip. Hasn't seemed to wear my already used rim surface down much. No blowouts but a mate blew tube on Enve wheels descending with a heap of braking at fast corners. First time i have used these, they work well and don't squeal, I am using carbon block on alloy wheels and they are fine. Easy to fit and would buy again, but they are a bit dearer than others.